Pro-Ject Primary review | What Hi-Fi? Buying a turntable isn’t unlike choosing a pastry in that you might be tempted to go for the one with the biggest slice. When it comes to budget turntables, the brand with the biggest slice of the market has long been Pro-Ject, thanks to its multi-Award-wining Elemental and Essential models. The vinyl revival has fiercely shaken up the market for turntables, with an influx of affordable competition both new (Crosley and Ion) and old (Sony, Audio Technica, TEAC and Pioneer). Pro-Ject has launched two new Primary turntables: the standard phono stage-free deck we have here, and a £250 Phono USB model that has a built-in phono stage and can convert vinyl to digital files via a USB output. Both Primary models are built on solid foundations, and that’s not just down to the feet the plinth sits on. Based on the engineering of the Elemental turntable, they share numerous components - including the 22cm tonearm with Ortofon OM5e cartridge (with pre-adjusted tracking force of 1.75g, according to our measurements). They share the Elemental’s motor, which has a built-in regulator to improve speed stability. While the Phono USB version has an integrated phono stage, the standard Primary model on test here has to rely on a partnership with external amplification – whether that’s built in to your amplifier (as with the Onkyo A-9010) or via dedicated phono stage like Pro-Ject's Phono Box E or the Rega Fono Mini A2D. Before you plug in cables and flick the side-mounted power switch, the drive belt needs to be attached. Pull it over one of two notches in the motor to determine the speed (33rpm or 45rpm). With anti-skate weight and tracking force pre-set, simply unlock the tone-arm from its cradle and you’re ready to go. It really is that simple – the Primary’s assembly requires as much effort as a pop-up tent. The acrylic dust cover fits nicely over the Primary’s smart matt-finished plinth which, like the Essential II, comes in black, red or white. Our inner fashion designer surfaces as we play Michael Jackson’s Bad for no other reason than its red sleeve lettering matches the colour of our sample version of the Primary. However, as we lower the needle, our attention soon turns to the sound. Even going in blind we’d probably have guessed at the Primary’s engineering heritage, for its balanced and detailed sound is reminiscent of the Elemental. There’s a sense of life to the presentation but the Primary strikes a winning balance between fun and sensible, avoiding sounding too in-your-face or hurriedly careless at one extreme or overly calculated at the other. It snaps through the buoyant melodies of Another Part of Me and Smooth Criminal, and has the insight to confidently lay down Jackson’s quivering inflections in Man in the Mirror. There’s boldness, and a coherent rhythmic structure, to the alchemy of the bass keys and snatching drum-beat, body to the piano and twinkle to the synthesized instrumental in I Just Can’t Stop Loving You, and a dynamic presence to the lead guitar lines through Dirty Diana that certainly isn’t a given at this price. As the numerous song references show, listening to one track soon becomes an entire album. It’s not a performance you will easily tire of, and that’s to Pro-Ject’s credit. 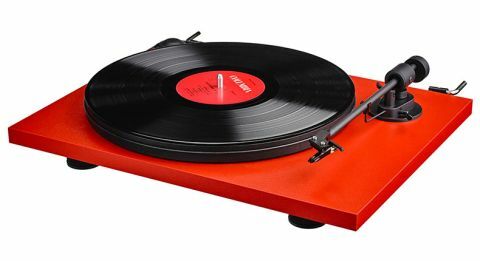 However we have to note that for an extra £60, you can get the Rega Planar 1 (£250), which brings a little more authority, rhythmic surefootedness and detail. Another £60 is another £60, though, and the Pro-Ject Primary is an entry-level solution more compelling than any other sub-£200 alternative we’ve heard. If you’re looking for a way ‘in’ to the record revival, the Primary is an excellent introduction.